We are a Leicester-based company and can supply a wide range of extremely high-quality, specialist, cost-effective door entry and access system solutions to meet any home or business requirements in the Leicester or Coventry areas. We offer reliable, high-quality intercom audio systems which have a range of fantastic features including two-way audio communication, the option to open doors or gates, or to release locking mechanisms. Where required, we are able to give you the option of including a high-quality built-in colour video monitor within our easy-to-use access system. This gives you the advantage of enabling you to see callers through the screen and provides you with an opportunity to view and verify identification. 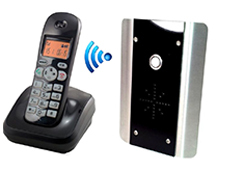 For larger premises, we are able to offer our easy-to-use wireless intercom systems. These allow you to answer calls, and allow access, from any location within the home or garden. As well as being incredibly easy to install, multiple handsets can be supplied with these systems where these are required. We have expertise in the supply and installation of simple and reliable access systems which utilise existing telephone handsets. For the ultimate solution in flexibility, we can supply a GSM-controlled access system with the potential to allow up to 1,000 numbers to be called, which is ideal for larger buildings. We are specialists in disabled access systems, with a wide range of expertise in the supply of high-quality automatic door opener units, swing and sliding doors. We are qualified to undertake high-quality repairs and maintenance to existing swing door and sliding door systems and our expertise even extends to installations which we did not originally supply and fit. We are also able to provide high-quality, specific, reliable safety detection systems and are happy to customise our entry systems to your specific business needs. We have the ability to supply and install our high-quality, professional, reliable door entry and access systems in Leicester, Coventry and surrounding areas. Take a look through some of the options available, below. If you need any more information contact our helpful team on 0116 236 6044. 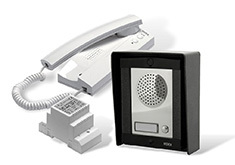 Intercom systems with telephone interface offer a perfect solution for larger properties the system allows your existing telephone handsets to call with an extra ring indication that the intercom is calling, normal phone calls can be made and answered if the intercom is called during a telephone call a busy tone is heard at the entry station. A simple hash and number combination can release doors / gates or locking. GSM controlled intercoms offer an excellent solution again where cables from the entrance point to property would be difficult and expensive to install. The system requires a mobile phone SIM card that can be contract or "pay as you go". The intercom will call up to 4 mobile or land line numbers allowing a simple hash and number combination for releasing doors / gates or locking. 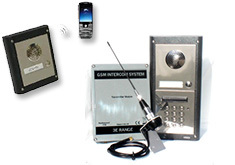 Larger GSM units are available allowing upto a 1000 numbers to be called, ideal for apartment blocks. This unit is a must with any gate system. The unit allows upto 1000 mobile or landline numbers to be stored, easily programmed via a text message. The unit is available to take any mobile tarrifs, once dialed the unit drops the call with no call charge, allowing a signal to open gates or switch a device. The Disabled Discrimination Act came into force in 2004. 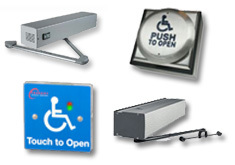 To help business comply with the regulations, Access Controls offers a wide range of low cost automatic or touch activated door openers designed for special access needs. All door systems are installed with all the latest safety devices conforming to the current legislation. Access Controls can also interface any automatic door opening system with any electronic locking or access system. We also offer repairs and maintenance to existing swing and sliding door systems not originally installed by us. A full site survey and risk assessment is available form our sales department. Access control specialise in the expertise of swing door automation and associated products, we can offer automation to any single or double door scenario, for either disabled or business usage. Systems offer the latest safety detection systems offering piece of mind for any business owner. Systems can incorporate locking and a wide range of entry controls to suite individual entrance requirements. 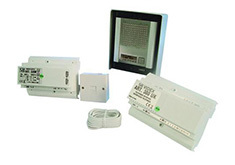 Automatic / radio and wired access systems can all be interfaced with any automated door system. Access controls offer a wide range of automated sliding door solutions offering a complete sliding door design and installation service. Our installation and service team are trained on a variety of sliding door control systems enabling us to provide the best automation solution for any sliding door scenario. We can also repair most existing sliding door systems, or offer a replacement retro-fit sliding door kit to enable most systems to maintain a continued operation. All systems have a parts and labour warranty together with a complete planned maintenance scheme. 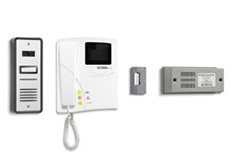 We also provide services such as alarm systems, access control and CCTV systems. If you wish to enquire about any of these services please fill out the contact form or call us today on 0116 236 6044.